Hackney renters evict newly elected councillors! 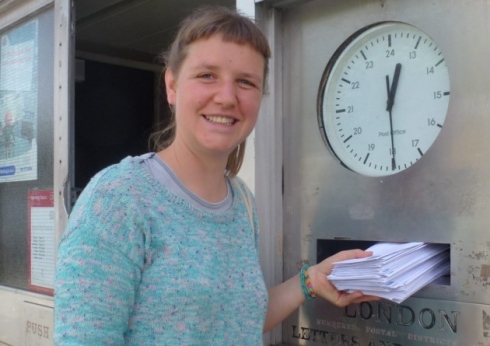 Last week, Hackney’s newly elected councillors got quite the shock when Section 21 Eviction Notices were dropped through their post boxes informing they had two months to vacate their homes. While obviously a spoof by Digs – or, as Hackney Gazette described us, “cheeky housing campaigners” – our Section 21 Eviction action had a serious message. Assured shorthold tenants (the majority of private rented sector tenants) have no security in their homes as landlords have the power to evict them at will at any time. Back in April we listened as election candidates publicly pledged to improve the situation for renters and make Hackney a safe, happy and enjoyable borough to live in if they were elected. At an event outside the Town Hall we presented them with a dossier of renter stories which we’d gathered through our Tell Us You Story campaign along with a list of demands on things like security of tenure, landlord licensing and the role of Hackney renters in shaping local housing policies. But given the sharp increase in evictions we’ve seen in places like Hackney, as landlords cash in on the housing crisis, we wanted to make sure councillors understand how it feels to be living with so few housing rights, knowing you can be evicted from your home at any time. Right across London renters are being evicted for standing up for their rights or by landlords keen to hike up rents. In some of the most shocking cases people tell us about, naked discrimination on the grounds of gender, race and sexuality is the reason for eviction. And the system is leaving renters unprotected as we scrabble for decent housing in a broken, unregulated market. We hope that our spoof Eviction Notices showed the councillors how quickly a tenant will have to vacate their home, search for a new one and gather the necessary funds to pay for unjustifiable fees to letting agents. We hope the Eviction Notices made them understand why a tenant would not report much needed repairs, faulty boilers, damp conditions or landlords entering their home without permission, out of a very fear they could lose their homes through a revenge eviction. Evictions, both real and threatened, mean renters face the constant fear of losing our jobs, children, support networks and communities we’ve built our lives in. Several councillors have already voiced their support, thinking the campaign was “innovative” and “thought provoking”. However, there is also one notable exception: a Hackney councillor who thinks the powers of landlords are not enough, and that there should be “immediate evictions for renters who cause a nuisance to neighbours”. We’ll carry on lobbing Hackney council to make sure their plans for landlord licensing and a social letting agency serve renters as well as possible. We need a landlord licensing scheme that protects tenants and allows them to report problems without fear of losing their homes. We need a system that strengthens the community of Hackney, that keeps children in their schools, that enables people to have strong support networks, and works for the health, the security and the stability of people’s lives. Tags: Activism, eviction. Bookmark the permalink.